Such a complicated sounding name for such a simple and satisfying recipe, as well asour contribution to last night’s supper club. The theme, “French-A Night in the City of Lights”. We were to have dined in the garden, under the stars and twinkling lights. Females were instructed to adorn themselves in their finest “bling” accessories. However, in typical Oregon style,it rained harder yesterday than it had in a long time. The party was moved indoors and a fantastic time was had by all. I have written about our supper clubs here many times. They are sacred , kid-free evenings, where we over-indulge in amazing food and wine with great friends. Last night was of course no deviation from that theme. Upon arrival we were greeted with French Martini’s (Chambord, vodka & pineapple juice) and Petit Quiches as we stood around admiring everyone’s “bling”. Filet de Boeuf en croute soon made its way out of the oven…and into my hands appeared French Champagne and some lovely red wine to follow. I was up next with my first-course of garden-inspired vichyssoise and freshly baked bread. The main course, Paupiettes, a type of roulade or braciole. A classically Frenchdish where a slice of meat is beaten thin and rolled with a stuffing and secured with a string before cooking. It was absolutely fantastic and something I had neverexperienced before. Some lovely 20 year oldBordeaux wines were shared as we moved onto dessert. Let me just say, dessert was a meal of its own; chocolate cake, quenelles of chocolate mousse, crepes with pastry creme and let’s not forgeta littleflambe and peach melba…decadent to say the least! It was a night to remember, as all nights in Paris are! 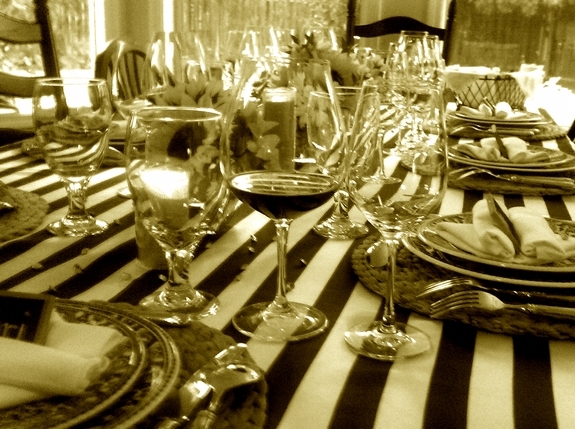 Of course we can’t wait until our next supper club takes place, we are definitely ready. Now, back to the soup and my inspiration behind it. Our supper club club theme had a little garden inspiration behind it, which is why I chose a zucchini version of vichyssoise. I looked at several recipes but found my muse in Ina Garten and Jack Czarnecki. Ina makes a lovely garden vichyssoise, but it needed to be elevated to what Irefer to as”supper club worthy”. Last summer we were lucky enough to attend a pre-International Pinot Noir Celebration (IPNC) dinner here in McMinnville. The private winemaker dinner was prepared by Chef Jack Czarnecki, an award-winning James Beard cookbook author as well as the founder of the Joel Palmer House restaurant here in Oregon. The meal…one of the finest I have ever had. One of the courses was a porcini mushroom vichyssoise, drizzled with the above Oregon White Truffle Oil, produced by Jack himself. This white truffle oil is what took this classic soup to the next level. Drizzling it over the top gave it a unique, earthy flavor. 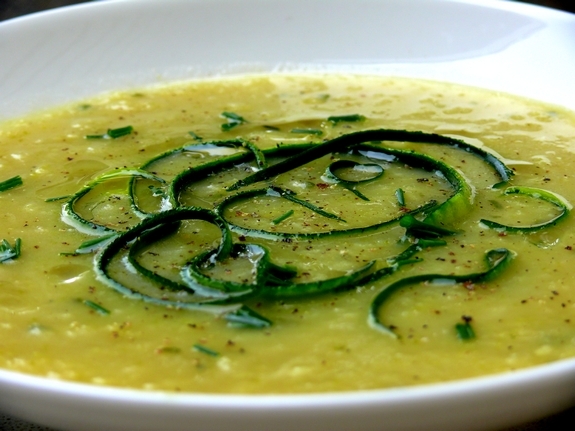 I knew I wanted to repeat that flavor in my zucchini vichyssoise, giving the soup that same memorable quality I experienced last summer with Jack’s amazing vichyssoise. I came very close. 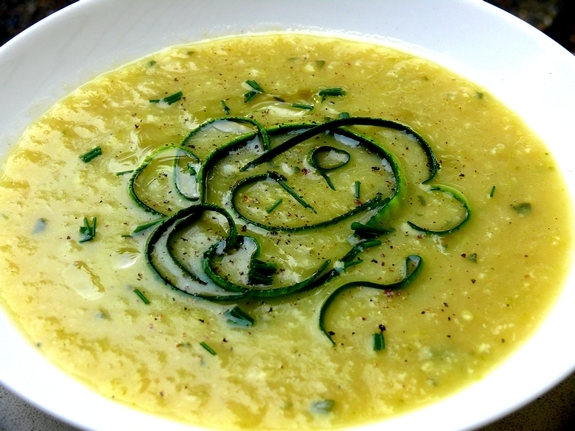 Using zucchini in this soup gave it a fresh, garden taste, which meant I had to choose my wines carefully. My first thought with this soup’s flavor profile was serving a French Sauvignon Blanc. However, good French Sauvignon Blanc was not readily available. I decided on two Sauvignon Blancs, one from California and another from New Zealand. I also opened a Pinot Blanc from Oregon and a Vinho Verde from Portugal. Surprisingly, all were perfect matches and it was fun trying all of them with this dish. We also knew our own Pinot Gris, with its citrusy flavor profile would also be a perfect match. However, since we drink our Pinot Gris all of the time, we wanted to offer something new and different as a pairing. Overall, we got to try some great wines that came together particularly well with this chilled soup. I highly suggest giving this a try. It is perfect for multiple course dinner parties as it can be made ahead and left to chill overnight. 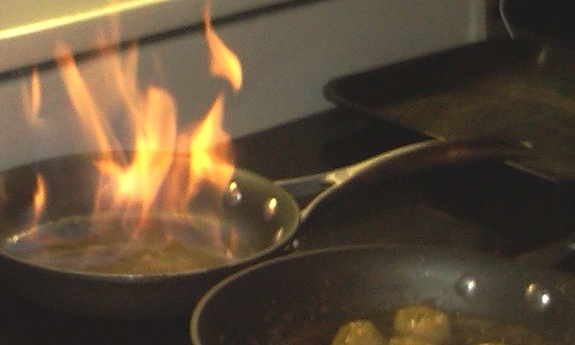 Heat the butter and oil in a large stockpot, add the leeks and saute over medium-low heat for 5 minutes. 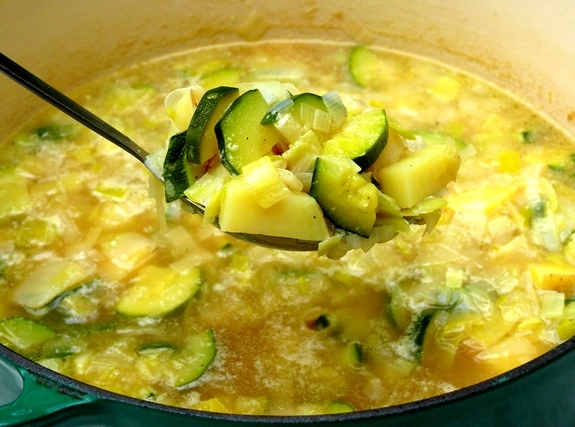 Add the potatoes, zucchini, chicken stock, salt and pepper; bring to a boil; then lower the heat and simmer for 30 minutes. 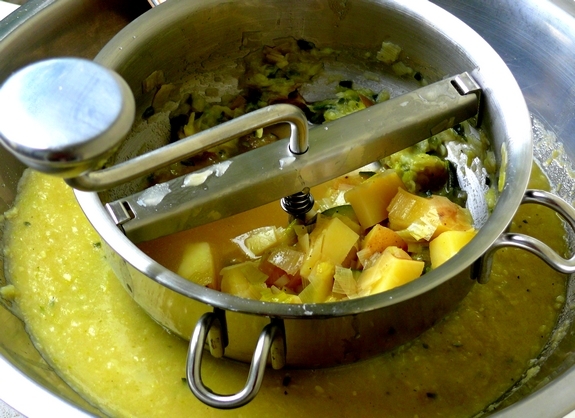 I chose to process the cooked soup through a food mill instead of using a blender (either will do). I prefer the texture the food mill makes as opposed tothe blender which makes a finer puree. Cool the soup fora few minutes and process through a food mill fitted with the medium disc (or in a blender in several batches). Add buttermilk and season to taste. Chill the soup overnight for the best flavor. Serve either hot or cold. We prefer the soup cold, chilling overnight for the flavors to meld. Garnish with chopped chives , which really kicks up the flavor, as well as julienned zucchini. 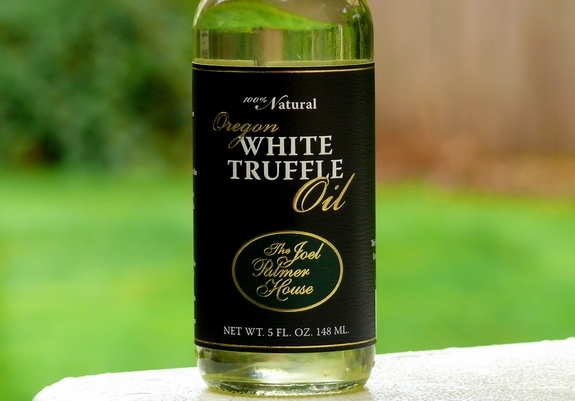 Drizzle top with truffle oil. Your soup looks so elegant. Love the garnishes on the top. I love reading posts about your supper club. It sounds like so much fun. Okay wow…I love a good cold soup. This will take care of those last summer garden zucchinis. Also, what a magical night you had!! Wow, what a night! And this soup…very nice…. The soup is interesting, will point my wife at it. She would do something like this, I would have made the chicken stock. A real luxurious soup, yet I could categorize it as comfort food at the same time! Wow, that sounds like quite the night and the soup had great inspiration. Need to get that oil, have seen it in the stores. Will buy now. Wish you could get your wine in at Joel Palmer House, I love that place and would love to have your Pinot Noir while I dine there!!! Hi there, looks delicious. I’m not sure if your email address isn’t working but I sent you something a few weeks back and am excited to hear your response. Thanks! Love the adult evenings as well as family nights. Great way to use that zucchini Cathy!! That’s a very nice soup; it sounds like your supper club is a great thing! I love the zucchini garnish, makes it look really fancy. I guess it’s kind of like Vegetarian Bacon…how is it called bacon when it’s not pork? However, it’s still called Veggie Bacon. Same concept, just made with different ingredients. Same with veggie burger, not made with beef. How is it a burger? I could go on and on here. Thanks so much for your input.